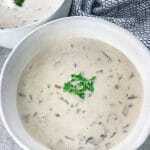 This Cream of Mushroom soup will shock you because it's thick and creamy without any dairy or flours used to make it. It's also oil-free and gluten-free, but doesn't compromise on flavor! Please use all organic ingredients when possible! First, soak your cashews for the cashew sour cream. You want to place the cashews in a bowl and fill it with warm water, covering the cashews. Then, set it aside. If you have a high speed blender like a vitamix you do not need to soak them that long, maybe 15 minutes or so. If you don't have a high speed blender I recommend soaking for 2 hours. Get all of the other ingredients ready. Mushrooms and onions chopped, cashew milk made (if using homemade) and all of your other ingredients for the soup. You can make the cashew sour cream while the soup cooks. On the Instant Pot, turn on the sauté setting. Allow it to heat for a minute or two. Add a splash of oil, water or veggie broth to sauté the onions, garlic and mushrooms. Sauté them until the mushrooms are wilted, stirring frequently for about 5 minutes. Add in the nutritional yeast, tamari and thyme and sauté for another minute or so. Next, add in the cashew milk and veggie broth and stir. Put the lid back on the Instant Pot and set the steam release knob to sealing. Then, select the pressure cook or manual setting, turn on low and set for 5 minutes. If you haven't already, make the cashew sour cream while the soup is cooking in the Instant Pot. When the cooking has finished, allow it to sit and naturally release for 5 minutes. Then switch the release knob to venting for a quick release of the rest of the steam. Open the pot, pour the cashew sour cream in and gently stir all together. Serve immediately or allow it to cool and store for later. It lasts for 3-5 days in the refrigerator and longer in the freezer. First, you want to soak your cashews for the cashew cream. If you're not using a high speed blender I recommend soaking them for at least two hours. If you have a good blender, like a Vitamix, you can soak for 15-20 minutes and it will be fine. Add all the cashew sour cream ingredients to the blender and blend until it's smooth and creamy. Taste it and if you need to add more salt, do so. Then set aside to add to the soup after it cooks. This makes a thicker, creamier soup. If you want it a little thinner replace one cup of the cashew milk with a cup of vegetable broth.